Peace is a wonderful reading in this book. It's a wonderful one to get. When you're in strife, and you're being drawn this way and being drawn that way, and you don't know if you did this right, or if you did that wrong, and then the Lord gives you Peace. He's saying, "Just calm down and rest in me. Be at peace. You've done what you could do." That's a very calming and reassuring one. Poverty. That's the place where we put a flyer sheet in, because Poverty is on the left, and Prayer is on the right. That's why we separate it. When we get Poverty, the Lord is telling us, "You don't need that." Now I'm not sure how it'll work with you, when you get Poverty, but when He gives us Poverty, he means, "Keep it simple. Don't go off the deep end with something." That's just what He means for us. I'm not sure how you would take it. Of course, Prayer. That's a call to prayer. When we get Prayer, we try to stop what we're doing, as quickly as we can, and go straight to prayer. After Prayer is Pride. That is such an ugly, ugly thing, that I have a fly sheet between that and the last page of Prayer. Pride is terrible. It's probably the worst thing in the world. It's the worst reading that I can get. You see a man wise in his own conceit? There's more hope of a fool than him. Look on one that is proud, and bring him low; and tread down the wicked in their place. The fear of the Lord is to hate evil; pride and arrogance, and the evil way, and the forward mouth do I hate. Woe unto them that are wise in their own eyes, and prudent in their own sight! If He gives me this, I just buckle. I know that I have overstepped my bounds. I'm contending with God. I'm not receiving God's wisdom or instruction well at all! I'm rising up and contending with Him in my own strength and my own wisdom. That's a Repentance Scripture for me. Prisoners has to do with those times when Simon's Cross is involved. When we get Prisoners, that means that we are contending for souls by offering our fast offerings and sufferings to the Lord, because He's setting Prisoners free. Captives of the mighty shall be taken away, and the prey of the terrible shall be delivered: for I will contend with him that contends with you, and your children I will save. He brought them out of darkness and the shadow of death, and broke their bands asunder. Prisoners is about salvation, and the Lord taking the spoils from the Evil Ones, and delivering the people into the Kingdom of Righteousness. God's Protection is a wonderful one! It means, "Yes, I know you're threatened, and Yes, I know there is danger all around you. Yes, I know it looks really bad; I am protecting you." We've gotten God's Protection, when we've gotten a Word from the Lord we need clarified. For example, one night Ezekiel asked the Lord, "I'm concerned that, perhaps, Clare's personality is getting into these messages too much.' He went to the Lord about it, using The Bible Promise as an oracle. He bound a lying spirit, and he opened to God's Protection, and that told him that the Lord is protecting me. He's watching over that, so that such problems won't happen. That made me feel good, too, because that's what I don't want. I don't ever want to be inserting myself into a message. Repentance is so important! If you get Repentance, it means that you've sinned, and you need to look at it. Or, perhaps, someone else has sinned, and you're helping them, and you need to tell them to repent. There's a fly sheet between Repentance and Righteousness, because they're on opposite pages. Righteousness is a beautiful one. When there is a situation in which there are many different people talking about something, and there are accusations flying wildly between people, and you go to The Bible Promises, and you get Righteousness, that means that the Lord is with you. A good man obtains favor of the Lord: but the man of wicked devices will He condemn. The Lord is a sun and a shield: and the Lord will give grace and glory: no good thing will He withhold from them that walk uprightly. Salvation, once again, is about the work of Salvation for souls. It's the work of contending for souls. It could have to do with a Simon's Cross. Or Salvation could relate to a situation where you're praying for a loved one, and you're asking the Lord the status of their heart, as far as being converted, and you get Salvation, that could point you to the fact that there is Grace being exerted here to help a soul to be saved...to help bring them in. Seeking God. I get that one when the Lord wants me to put everything down and go into prayer. It's good for them to wait for Him, to the soul that seeks Him. When you seek the Lord, your God, and you will find Him, if you seek Him with all your heart and with all your soul. And the hand of our God is upon all of them who seek Him; but His power and His wrath against all them who forsake Him. Seeking God is beautiful, because it is a call to deeper prayer, and more commitment to prayer. Self-Denial. "No Magnum Bars, Clare" (laughing). "Pass up the Magnum Bars." get Self-Denial, we know we can't do that tonight. That's not on the Lord's agenda for tonight. Self- Denial is a pretty downright tap to say "Deny yourself. Pick up your cross and follow me." Remember that one. Self-Righteousness is a yucky one. There is a generation that is pure in their own eyes and yet is not washed from their filthiness. Oh, how lofty are their eyes, and their eyelids are lifted up. The way of the fool is right in his own eyes: but he who harkens unto counsel is wise. This reading is almost as bad as Pride. You say because I'm innocent, surely his anger shall be turned from me. Behold, I will plead with thee, because thou sayest, I have not sinned. Basically, it is saying that if you think that you are without sin, then you had better look again. This is a serious one, because Self-Righteousness stops me dead in my tracks, and I think to myself, 'My thinking has gone the wrong way here.' I'm just as guilty as the next man. I don't need to be trying to cover up my stuff. Sexual Sins often has to do with compulsiveness - obsessive compulsive behavior. There is no temptation, which has taken you, but such is as is common to man: But God is faithful. He will not suffer you to be tempted above what you are able; but with the temptation will also make a way to escape, that you may be able to bear it. There's no temptation, which has taken to you, but such as is common to man: But God is faithful. He will not suffer you to be tempted above what you are able to bear. but it's all common to man, and that the Lord was tempted in every way but didn't sin. Then I know that I just need to lay down with it. This is not something that I need to pursue. The other meaning to Sexual Sins could also be addictions. Drug addiction; addiction to lying; any kind of compulsive, addictive behavior could be under Sexual Sins, if you get that as a reading. Then, of course, obviously, fornication, or anything similar, you could open to Sexual Sins. We have found that nine times out of ten, for us, it refers to compulsive behavior and knee-jerk reactions. Shame. I never know how to take this one. Whoever believes in Him shall not be ashamed. And hope is not a shame, because the love of God is shed abroad into our hearts by the Holy Ghost, which is given unto us. And though we suffer these things, ne'ertheless, I am not ashamed: for I know whom I have believed, and am persuaded that he is able to keep unto him that which I have committed unto him against that day. These are some beautiful promises under Shame. Sickness. When we've seen this, it has to do with compulsive behavior, and a need to know, or a need to do, or a need to be...just a need that drives a person. We're often talking about obsessive-compulsive behavior. Or, at times, it could be physical sickness. Sometimes, if we ask the Lord if He knows what is going on here, there will be an illness - a physical illness - and He'll give us Sickness and tell us how to pray for the person. Sometimes, Sickness means that there's a Sickness of the mind. The mind is not level, and it's not understanding life properly, and it's not coping properly, so it can also mean that. Sin, Freedom from. Or Freedom from Sin. When I get that, I know, right away, that I've sinned. If I was wondering, 'Did I overdo it here or there?' And I get Freedom from Sin, I'll know, 'Yep. You overdid it,' and I'll have to repent. Sin, Redemption from. Same thing. The Lord's letting me know that I fell. Slander and Reproach. That's when people are gossiping about us. And they're saying things about our Ministry, calling us 'false prophets' and putting us down or taking our words and twisting them to say what they want them to say. It basically means that we're being spoken against. Slander and Reproach. The Lord is calling for prayer and forgiveness, so that we pray for them and forgive them. Blessed are ye, when men shall revile you, and persecute you, and shall say all manner of evil against you falsely, for my sake. Rejoice, and be exceedingly glad: for great is your reward in heaven: for so persecuted they, the prophets, which were before you. Slander and Reproach is usually about that. Success is a wonderful reading. Wealth and riches shall be in his house: and his righteousness endures forever. Every man also to whom God has given riches and wealth, and has given him the power to eat, and to take his portion and to rejoice in his labor, this is a gift of God. So, for us, success is a wonderful, wonderful thing. It means that what we're working on is going to work well. It's going to bear fruit. That's a wonderful one! Success also means, "Stay at it! You're going to have success. Just keep working at it. You're going to bring forth fruit in its season. Whatever you do will prosper." Trust. We don't get this one very often, but when we do, it's about letting go of our fears and knowing that God's going to handle it. He's got it in His control absolutely. The Lord is a sun and a shield. He'll give grace and glory. No good thing will he withhold from them that walk uprightly. Trust in the Lord with all your heart, and lean not unto your own understanding. In all your ways acknowledge Him; He will direct your paths. When we get this Scripture, it means "Go with the Lord and trust Him." Wisdom. We don't get this one very often either, but if we get Wisdom, we'd probably think that the Lord wants us to seek His Wisdom, and that we need to ask. If anyone lacks wisdom, let him ask of God. Word of God. I get that sometimes when I'm teaching, and I ask the Lord if I'm approaching this the right way - "Is this the message you wanted to get across, Lord?" - I'll get Word of God, and that will be a beautiful confirmation that it is. Blessed is he that reads, and they that hear the words of his prophecy, and keep those things which are written therein: for the time is at hand. The word of God is quick, and powerful, and sharper than any two-edged sword, piercing even to the dividing asunder of soul and spirit, and of the joints and marrow, and as a discerner of the thoughts and intents of the heart. 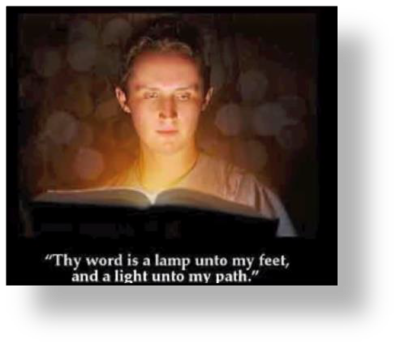 Search the scriptures, for in them you think you have eternal life: and they are they which testify of me. That's a good one to get! Work is always a good admonition to get busy. Be strong, therefore, and let not your hands become weak: for your work shall be rewarded. Work is a very, very encouraging reading. Worry. Be careful to worry for nothing; but by prayer and supplication with thanksgiving, let your requests be made known unto God. Stop worrying. Trust the Lord. He's our refuge and a very present help in trouble. Therefore, we will not fear, though the earth be moved, and all mountains be carried into the midst of the sea; though the waters thereof roar and be troubled, though the mountains shake with the swelling thereof. The psalm that I wrote, In the Storm, was very much like that - that the Lord would be with us in the storm. When the mountains shake the seas, then He'll come to rescue me. every-day life in The Bible Promises. I know that this is a long teaching, but I really did feel quickened in my spirit, by Holy Spirit, to share this with you. You could really make this little book, and the Scriptures that are in it, a very familiar tool to you, to see just exactly how we work with this tool, and how the Lord works with us, using this tool. May the Lord bless you and give you understanding, and help you to comprehend His perfect Will, and, of course, along with that, to give us all the grace to obey.